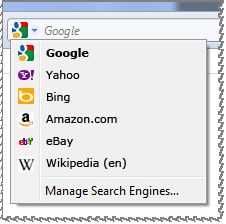 Bing and Firefox today announced that Bing will be included as one of the search engine choices within Firefox on both the Mac and PC. “Google remains the most popular general search and it will remain as the default search option, unless you change it. We will also continue to include Yahoo! as the second option for general search. Yahoo! has a loyal following and continues to provide a differentiated user experience, even as it integrates the Bing engine for its algorithmic search results. These changes will mean that English-language versions of Firefox 4 will display the following search services, in this order: Google (default), Yahoo!, Bing, Amazon, eBay and Wikipedia. The choices available to Firefox users will vary around the world, says Mozilla. It’s been possible to add it manually for a good while now. Hi… This is a good news. Suggestion: Bing must take-over Google as default in Firefox homepage too. This will create more users.